The hydrogen atom easily invades into metals and interacts with various lattice defects, such as dislocations, grain boundary, and secondary particles causing degradation of the mechanical properties, well-known as hydrogen embrittlement. 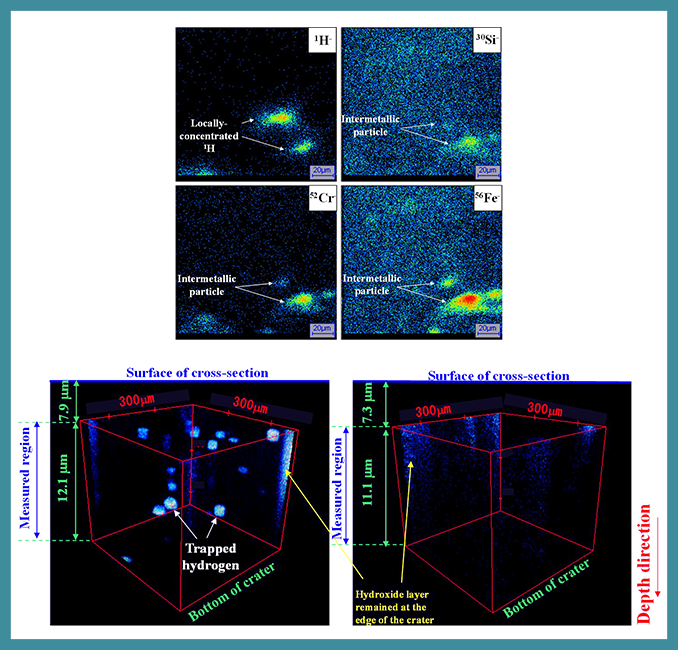 2D and 3D SIMS imaging of hydrogen trapped at intermetallic particles in a practical aluminum alloy: 6061-T6 that has been exposed to high-pressure hydrogen gas: (A) 2D ion maps of 1H-, together with 28Si-, 52Cr-, 56Fe-, (B) 3D image of 1H-, (C) 3D image of 1H- after thermal desorption measurements. The measurements were performed on an IMS 7f. Hydrogen trapped at intermetallic particles in aluminum alloy 6061-T6 exposed to high-pressure hydrogen gas and the reason for high resistance against hydrogen embrittlement. J.Yamabe et al. International Journal of Hydrogen Energy, 42, 24560 (2017).